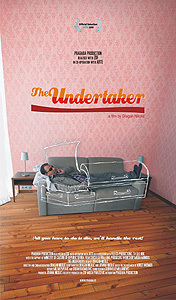 The world premiere of THE UNDERTAKER, a film by Dragan Nikolic, will be on Sunday, the 24th of November at IDFA 2013, in the Munt theatre at 20:00 o'clock. Registered viewers of Docs for Sale can view the film at Docs for Sale library and online. A Serbian named Bata works in his father-in-law's company “Drnda International”, an undertaker's business. Mr. Drnda started the company when he returned home from working as a laborer in Germany and Austria. It's now an international business with 26 hearses, which bring Serbians who died abroad back home, or tourists whose vacations in Serbia ended badly. At this point, the owner has limited his own activities to thinking up ads and determining the long-term corporate strategy. Bata drives back and forth between Eastern and Western Europe transporting corpses trying hard to look calm and collected. But an ever-gray sky, hits of yesteryear on the radio and heated exchanges with customs officers take their toll on him. After all, undertakers have to blow off some steam, too. This isn't a morbid tale of death (we don't even get a glimpse of a dead body), but rather an intimate portrait of an undertaker. He achieved a great success with previous projects: as a complete author of documentary films – The Caviar Connection, National Park and Hot Line shown and awarded at the big world festivals (IDFA 2008, Berlin Film Festival 2007, IDFA 2006...); as a cinematographer of – Bar De Zi, the best Romanian documentary in 2007; as a co-scriptwriter of - Made in Serbia, which was the first Serbian documentary regularly shown in cinemas (2005); as a co-scriptwriter and director assistent of a short fiction film - Run Rabbit Run, which received the first award at Cannes Film Festival in sinefondasion category in 2003. Prababa Production is a leading Serbian production company specialized in creative documentaries, founded in year 2007 by Jovana Nikolić. Our films have been awarded and shown at the biggest film festivals such as IDFA, Berlin Film Festival, and others; they were made in co-production with ITVS International (USA), and in association with Channel 4 (UK), YLE (Finland), SVT (Sweden), Jan Vrijman Fund (The Netherlands), World Wide Fund, European Cultural Foundation, Films Transit International and Serbian Film Fund; they were broadcasted by Channel 4, PBS, NRK, BHT, RTS, SVT, YLE, DBS, etc. Stories in our focus deal with human interests, environment, politics and culture.